Service Dog Training is completed in phases which alternates between onsite training and the home environment. The focus is to align all the participants in the process as relational change takes hold and advances towards certification. Phase III represents PTSD and Emotion Support Designation while Phase IIII is task specific via physical abilities via support and picking up objects. The consultation and assessment process is an opportunity to have all of your questions answered regarding the process etc as well as for me to meet your potential service dog candidate ( if you already have a dog ) or assist with obtaining a suitable dog for training. This consultation can be completed onsite or at your home. The consultation is approx 30 min - 1 hr. During Phase I the focus is on relational change which is the foundation for the Service Dog Standard. As change begins to take hold the service dog is introduced to other dogs, people, environments and situations. This phase involves aligning the owner with the service dog both within the home environment and other areas. 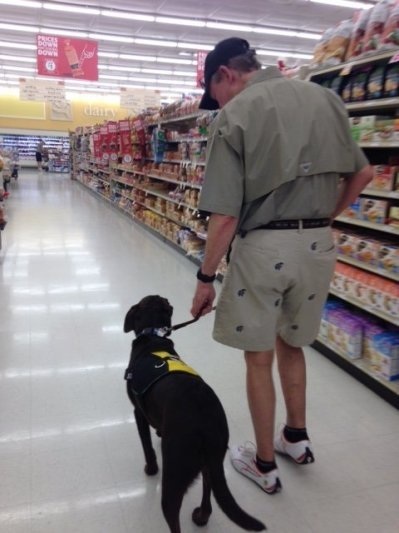 This "mirroring" process transfers relational change to the owner and aligns the service dog within the helper role. During this phase the focus is on advancing the relational changing process to a very high level. The dog defaults into a sit position automatically as well as responds to commands. Task specific training begins during this phase. During this phase of training the focus is on task specific training such as picking up various objects, physical assistance and other helper tasks specific to the owner's needs.